What, you want more than just HD remastered versions of Metal Gear Solid 2, 3, and Peace Walker? 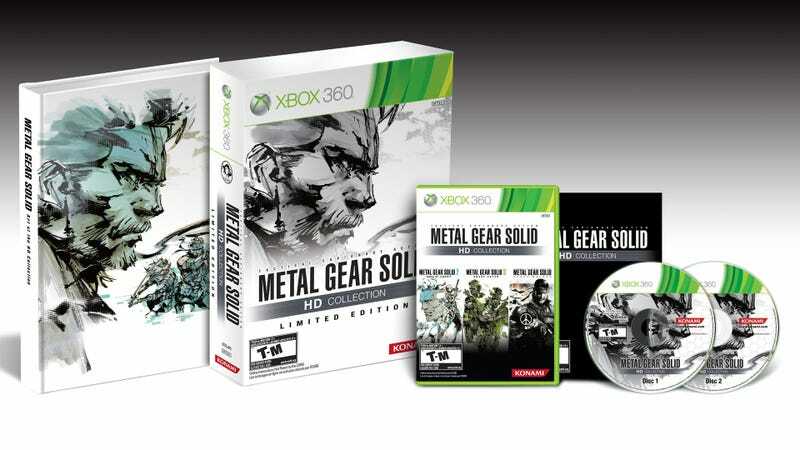 Then what you want is the Metal Gear Solid HD Collection, which comes with an art book and so much more! Okay, one thing more. And it's technically not even a thing, really. It's packaging, with designed especially for the collection by series lead artist Yoji Shinkawa. Inside that packaging you'll find the game itself, along with that art book I keep mentioning. "The Art of Metal Gear Solid" (great title) is 248 pages of sketches, paintings, concept art, and other stuff, bound in the same special artwork as the packaging. Konami gives no price for the art book and its packaging, but I'd guess it won't be much more than twenty bucks over the $50 price of the plain vanilla version. It's not much, but who doesn't love art books?